Nothing tastes more like Canada than maple syrup. 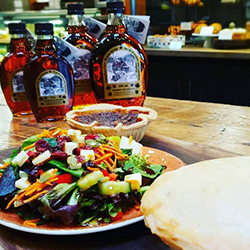 And throughout April we’re celebrating the taste of maple at the Market with all kinds of maple inspired creations made with local syrup produced right here in Simcoe County. 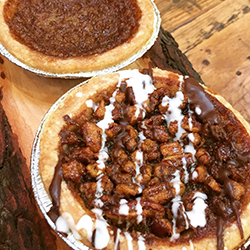 Maple-dipped Sugar Cookies, Maple Pecan Tarts, Maple Taffy Pie…plus lattes, sandwiches and salad creations all with a maple twist. Did I mention our Lumberjack Pizza topped with maple bbq pulled pork, bacon, cheddar and you guessed it-a wee drizzle of pure Simcoe County maple syrup? From our famous Hot Cross Buns positively plum with raisins and fruit, to Paska, our Ukrainian Easter Raisin Bread, the bakers have created a little Easter magic for your family to enjoy. 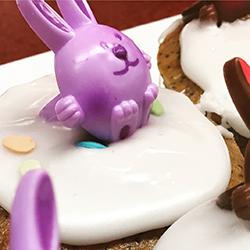 Our showcases are bursting with bunny cupcakes, sugar cookies and decadent chocolate creations. And don’t forget the parkerhouse rolls for the Easter dinner table. We’re open all weekend too, including Good Friday and Easter Sunday from 8am till 5:30 pm so be sure to hop on in! Going Wheat Free? Vegan? Dairy Free? You’ll be surprised how many of our ‘everyday’ bakery and café items are vegan or dairy free. To make it a little easier to navigate you’ll find 3 mini brochures at our counters that list all our ‘signature’ vegan, dairy free and wheat free items that can be grabbed right off the shelf. You’ll also find lists of all the cakes, pies and cookies that can be special ordered ahead of time including vegan, dairy free and wheat free dessert cakes. Need help ordering? Just give us a call or email us at info@mariposamarket.ca and we’re happy to lend a hand. On the keto diet? Our bakery manager Eric’s got you covered with a bunch of keto approved hot entrees that are truly delicious. There’s a Keto Bacon Cheeseburger Pie, a Keto Beef & Mushroom Casserole along with a fab Keto Broccoli & Casserole Bake that’ll keep you on course. And Carrie-Lynne 7 Carrie created some terrific keto coffee options too including some fab spiced lattes. 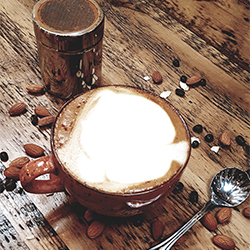 All our coffees & lattes are made with a top notch MCT oil, coconut oil and your choice of unsweetened almond milk, coconut milk or heavy cream.